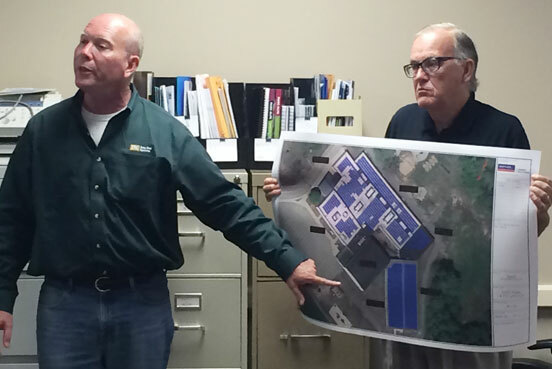 Kurt Penny (left) and Joe Fitzpatrick of IRC Solar Roof Systems present the company’s proposal for a solar array on the Dennett Elementary School’s roof. The two met with the Plympton Board of Selectmen on Monday, August 10. On Monday, August 10 the Board of Selectmen met in Plympton. The most electric issue by far was a proposal by IRC Solar Roof Systems of Lewiston, Maine, that would like to build a solar array on top of the Dennett School roof and enter into a fixed-rate Power Purchase Agreement (PPA) with the Town. Chairman Mark Russo made clear to everyone assembled that the Board was “just listening to a proposal,” and that nothing final has been agreed to. Two representatives, Joe Fitzpatrick, of DG Green Power which works with IRC, and Kurt Penny of IRC Solar Operations, made a presentation to those attending. Dennett Elementary School Committee members called a concurrent meeting within the Selectmen’s meeting, to view the company’s presentation as a committee as well, and Maureen Springer of the Silver Lake Regional School Committee was present as well. IRC representatives echoed much of the information that had already been presented to the public and the Board. A large portion of the Dennett School roof is need of repair whether or not solar panels are installed, and that is a known upcoming large bill, according to Town Coordinator Dale Pleau. IRC would come and do engineering studies, replace the roof, at cost to the town, and install, maintain and guarantee both the roof and the solar array that they propose for 20 years. The installation at maximum would produce approximately 451,000 kw/h per year and save approximately $42,000 per year, according to IRC, representing significant savings, as the Dennett School uses the most electricity of any town buildings. At the end of the PPA, the panels would either be removed, or replaced by the company and a new PPA would be negotiated. According to the representatives, the solar energy would be used right at the school, as well as sold to their investors, but the Dennett School will never be entirely “off the grid,” for example, when electricity is needed at night. The savings also come from the 40% lesser cost when the Dennett School is purchasing Eversource energy. IRC emphasized that the project would require no upfront investment from the town or school, and the possible educational aspects of teaching students about solar electricity. “This is becoming more and more common in schools in the Commonwealth,” according to Penny. One final push from the company was a reminder that tax-credits to offset the cost of solar energy end in 2016, thus the project would have to be completed by then. In order for the town to move to the next step, IRC said that a letter of intent would need to be signed so they could hire engineers to evaluate the roof, and determine if the roof can support the solar units. If the town backed out at any point during this stage, they would only be obligated to pay for the engineering reports which could be useful in further consideration of the roof repairs. Selectperson Christine Joy wished to know specifically what parts of the roof were being discussed and if not all were viable for solar, would the project still be profitable, to which Penny responded that any part of the roof, or all, would be viable for the company. Michael Antoine, of the Dennett Elementary School Committee stated, “I’m not opposed to solar, just holes in the roof.” He was reassured that IRC Solar is a roofing company, and guaranteed their work. Further concern from the School Committee involved making sure workers on site were fingerprinted and background checked, and that work could not be done while school was in session. Questions about snow and the weight of the solar panels were discussed, as well as safety systems for disconnecting the panels in the event of an emergency. “Code is code,” said Penny. There are very strict rules for building solar arrays, and the fire chief must sign off on safety permits. Town Coordinator Dale Pleau at this point pushed to encourage a letter of intent be signed by the Selectmen and/or the School Committee so that an engineering study can begin, which will be needed at some point anyway, according to Pleau. Both Jon Wilhelmsen, of the School Committee, and Russo refused to sign anything without further consideration. “I’m not signing anything tonight. I’m bringing this back to the whole School Committee,” said Wilhelmsen. Maureen Springer, representing the Silver Lake Regional School committee, expressed displeasure at not being notified that solar presentations were being scheduled and she had to find out about it by reading the newspaper. Selectmen said they would do better at notifying all concerned through email. Several weeks ago, a private soccer club, CS United sought permission from the Selectmen to lease fields owned by the town. The board expressed that they did not believe there was any precedent for private lease of town owned fields, although they suggested the new Jason field might be a viable location as it is currently underused. Kevin Kaupp, new chair of the Recreation Commission, reported that last spring, at the invitation of Carver Youth Soccer in exchange for some coach training, the Recreation Committee allowed US Soccer Elite, a private soccer club, to use playing fields at the Dennett School. Kaupp said that US Soccer Elite has approached the Recreaction Committee and asked to rent the Dennett School soccer fields when school is not in session and when the fields are not in use by the Dennett two week nights and three hours on Sunday. The Recreation Committee would collect the rent through its revolving fund and use the proceeds to help pay for the maintenance of the fields and its irrigation system which the RecCom has paid for several years. This led to several school board members questioning who has jurisdiction over the “physical plant,” the school building, and the fields, and who should collect the leasing fees. Selectman Colleen Thompson compared it to a, “tenant/landlord relationship,” where the town is the landlord of the building known as the Dennett School, but the tenant is the school, directed by the school committee. All parties agreed that Town Counsel would likely need to be consulted to sort the matter out.